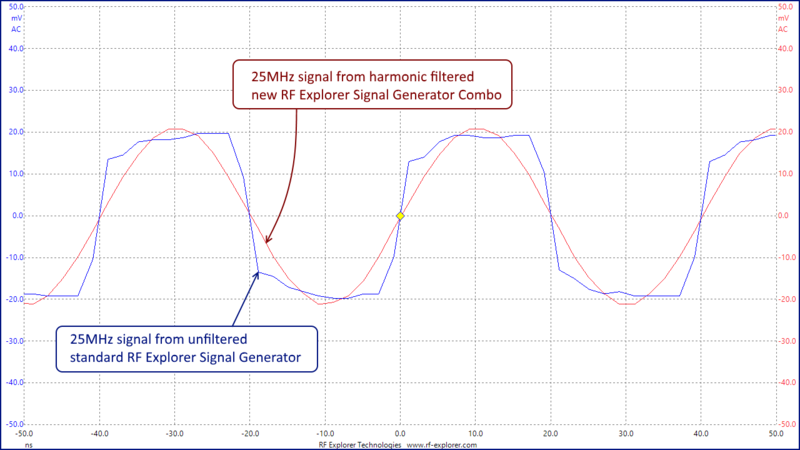 RF Explorer Signal Generator Expansion adds major improvement to the standard RF Explorer RFE6GEN Generator. The new generator expansion board includes important functions requested by our most demanding customers. By adding this expansion board the RFE6GEN becomes an RF Explorer Signal Generator COMBO. The new Expansion product extends the RFE6GEN to include harmonic filtering, high-performance amplifiers for higher output power, fine amplitude adjustment and support for frequencies as low as 100KHz covering up to 6GHz with no gaps. See below comparison of a 25MHz signal generated with new improved RF Explorer Signal Generator Expansion (in red) and a signal generated with standard unfiltered RF Explorer RFE6GEN (blue). The new Generator Combo offers a perfect sinusoid filtered signal as opposed to the squarish unfiltered signal from RFE6GEN. Please note that you need to order the top cover SKU 114991543 for correct assembly of the new expansion board. This is a separated accessory.